Villa Sampaguita is situated only 10 minutes drive outside the historic town of Asti, the major center for the Piemonte wine region, an ideal base for touring all the vineyards and wineries as well as sampling the glorious and world-famous wines and cuisine of North East Italy. The city of Alba famous for it's yearly truffle fair and the Barolo wine area as well as the historic city of Turin are 30 minutes drive. Villa Sampaguita features two self-contained apartments, one with two bedrooms another with one bedroom. The two bedroom apartment has a living room/kitchen and has one bedroom with a double bed (queen) and the other with a double, which can be converted to twin single beds. There is also a divan in the living room, which can sleep an extra person. There is one bathroom with combination bathtub shower). It is self-contained with it's own kitchen and private entrance separate from the main B&B. Breakfast and dinner can be provided in the main B&B on request as well as cooking lessons. We also have a self-contained one bedroom apartment which can sleep up to 4 persons. Please contact owner. Villa Sampaguita is the home of Rina Vargas and Tim Brewer. Tim was originally from Africa (South Africa & Kenya) and has lived all over the world including California where he planted his first vineyard before moving to Asia in 1984 (Hong Kong, Singapore, Philippines, Indonesia), first pioneering setting up satellite-television stations, then marketing satellites and related business ventures, eventually ending his satellite career in Moscow as consultant for the Russian Satellite Organization. Rina was originally from Bicol in the Philippines (renown for its beautiful ladies! ), we met in Manila and started a business running a restaurant and a hotel on a motor yacht anchored off Boracay Island, one of the world's premiere paradise locations (featured on Windows 2000 'Paradise' wall paper). In 1996 we moved to London from Moscow and lived in Hampstead and Totteridge. Three years later Tim's work moved him in to Taiwan, and after spending a a year in Taipei, we decided to change our lives and move to Northern Italy to find a vineyard property which we could convert into a small hotel. Why Italy? We had friends in Piedmont and when we visited we fell in love with the ambience, the climate, the lifestyle and the perfect location, not to mention some of the best wines and foods in the world. We arrived on Easter of 2001, and spend three months searching for the ideal place for us to convert into our dream. It was quite an experience and one day we will write a book. We looked over 25 properties, some of which we fell in love with, but always something came up, either the price wasn't right, the location wasn't suitable, the vines were sick, the reconstruction was too difficult, the neighbours wanted to claim part of the land and so on and so forth. Some notable places included an old convent complete with chapel, bell tower and crypt; a landmark castle vineyard with a 300 year old manor house, an old stone mill and an entire valley of vines. Finally we came across Cascina Barone at Bricco Cravera, which had virtually everything we were looking for to create a really special place for people to come and stay and explore this wonderful part of the world. The location near Asti is perfect for easy accessibility to Piedmont's central wine hills as well as being close to Turin and a reasonable drive to the mountans, lakes and Mediterranean. 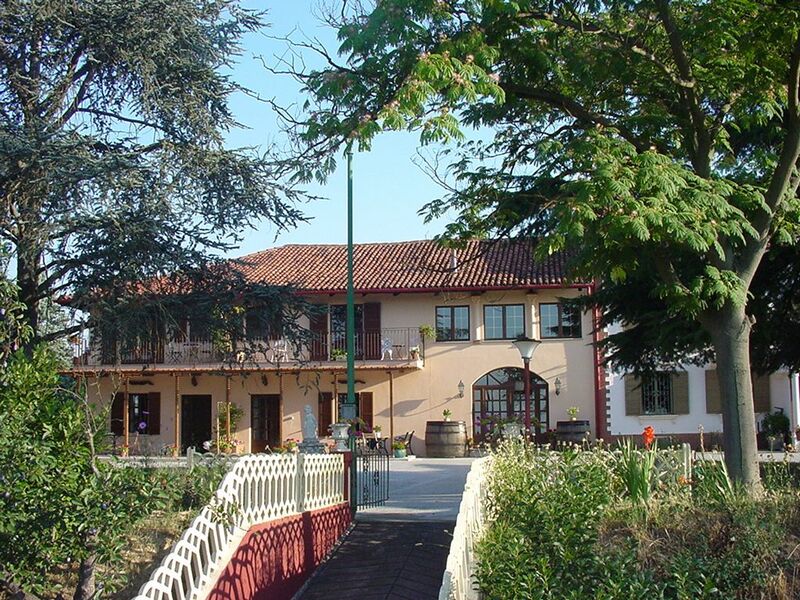 Villa Sampaguita was built at the turn of last century as a 'Cascina' or working farmhouse, which included house, stables and barns under one roof, with a large underground cantina (wine cellar) for making wine. The house and was lovingly restored and modernized by its previous owners and we have rebuilt the huge barn area into 4 deluxe suite-rooms each with its own bathroom and view of surrounding countryside, plus two self-contained apartments. In addition our guests have their own salone d'hospiti (guest lounge) complete with library and satellite TV. Villa Sampaguita is 10 minutes drive outside the historic town of Asti, the major center for the Piemonte wine region, an ideal base for touring all the vineyards and wineries. Villa Sampaguita lies on top of a ridge surrounded by woods, orchards and vineyards, with panoramic views over the Monferatto hills and Asti in the distance. We are located in a national park. Villa Sampaguita is situated only 10 minutes drive outside the historic town of Asti, the major center for the Piemonte wine region, an ideal base for touring all the vineyards and wineries as well as sampling the glorious and world-famous wines and cuisine of North East Italy. The city of Alba famous for it's yearly truffle fair and the Barolo wine area are 30 minutes drive. We are also close enough to Turin to make day tours and an hours drive to Liguria for a seaside day.